Lorenzo Casali and Micol Roubini started to work together in 2010 during an artist residency program at the Guesthouse in Cork, Ireland. 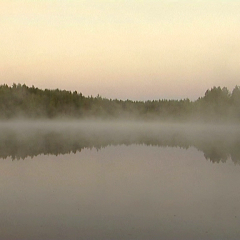 In 2011 they have been invited for a residency at Novia University of Applied Sciences in Nykarleby, Finland, where they developed the video/book project Green Gold printed with the support of Svenska Kultur Fonden. They have been selected for the residency Aperto 2012, a project of the Cultural District of Valle Camonica, and later they participate at the Premio Città di Treviglio where they won the first prize. In the same year they shot Atlante Silvestre, which gained the production budget Passion from Filmmaker Festival, where it has been screened together with Green Gold. In 2013 some solo exhibition took place: Vicino/Attraverso at Careof-DOCVA in Milan, curated by G.Scardi, L’oro verde at the Civic Cultural Center of Treviglio, At dusk at Senzatitolo in Rome. During the summer they have been in residency at Hotel Charleroi in Marchienne, Belgium, and at the Scottish Sculpture Workshop where they shot Arrange your rocks naturally, later presented at the 24th Filmmaker Festival at Spazio Oberdan in Milan. Among the main group exhibitions as an artist duo: Au fond de l’aire at the Brasserie des Alliées, Charleroi; Il/naturale, at MAG in collaboration with MART Museum of Trento and Rovereto and curated by Der Blitz, I sensi del mediterraneo at Hangar Bicocca, Milan, Terra, Stills – Scotland’s Centre for Photography, Edinburgh, curated by Careof DOCVA, VideoVareo e Focus On at the Sub Urban Video Lounge, Rotterdam, Dove non si tocca at Museo Tornielli in Ameno, curated by G. Scardi. Through installation, sound, video and photography, their work is based on the accurate study of a specific site and proposes a critical and poetic reading of the landscape. Lorenzo Casali was born in Tradate (VA) in 1980. He graduated in sculpture at the Academy of Fine Arts in Milan in 2004. Since 2001 he participated in several exhibitions, screenings and awards in Italy and abroad. In 2005 he realized the project Contesto – site specific installations in Navelli (AQ). Albedo (2006), his first solo show, and Blank (2010) took place in Senzatitolo in Rome. In 2007 the Chamber of Commerce of Rome commissioned him the video Pulsar, later presented in the Hadrian’s Temple. In 2008 he was selected for residency program in Duende Studios and Kaus Australis in Rotterdam. Later that year the solo exhibition Traguardo was presented at Ikona Gallery in Venice. In 2009 he won the Movinup grant and later he was selected for theR.Pezza Awardwith an exhibition at the Museum of Contemporary Photography in Cinisello Balsamo, Milan. In 2010 the project RecentRuins was presented in Rotterdam in solo exhibitions at the Berlage Institute, Mirta Demare Gallery and Historical Museum. He took part in Enigma, a group exhibition in TENT. Rotterdam and was nominated for the Special Italia award by the Photography Foundation of Modena. Micol Roubini was born in Milan in 1982. She began her studies at the Academy of Architecture in Mendrisio, later enrolled at the Academy of Fine Arts of Brera in Milan, where she graduated after a year spent at the Universität der Künste in Berlin. In 2008 she got a degree in audio technology at Irmus, Institute for Musical Research, department of the Scuola Civica, Milan. After graduation she began to show her works in exhibitions and screenings: 2007, Lo schermo ansioso, Verona; Corpo/REO – Short Video Convention, Brescia, 2010 Camera Video, March Foundation, Padua, Loop Festival, practica e diffusione dellavideo arteinItalia, Barcelona, ArtinKaunas, Kauna, Litany, Tina Bfestival, Prague, Camera Video, Palazzo Ducale Genova. Since 2007 she works as a sound engineer for various orchestras of classical music and as a sound designer for filmmakers and video-projects/installations for personal projects and also in collaboration with other artists.
" Much of what we call natural is not really so, but is actually artificial: since cultivated fields, trees and plants grown and arranged in a certain order, rivers confined within precise boundaries and directed toward a definite course, and other such features, have neither the condition nor the appearance they would have naturally". (Giacomo Leopardi, In praise of birds) Green Gold is a Finnish expression that refers to forestry; to that treasure considered fundamental for the economic system of the country, constituted by lumber of firs, pines and birches. 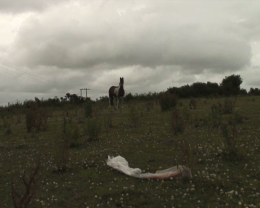 This video, part of a wider project including also a book and two photographic series, focuses on the intricate relation between original wilderness of a landscape and human intervention, deeply manipulating and altering the natural element. It has been conceived in 2011 during an artist-in-residence period at Svenska Konstskolans i Nykarleby Vänner, Nykarleby, Finland, and later edited in Rotterdam. 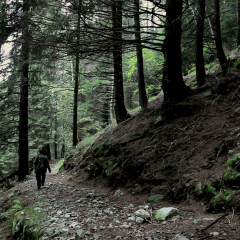 Woodland Atlas has been shot in Vallecamonica, in the surroundings of a small village in the Italian Alps, Braone. The camera scans the landscape along the Palobbia torrent shooting, without distinction, natural elements and signs of human presence, people and activities related to that specific territory. The traces of these events seem contradictory: the lively water of the stream and the derivation-channels used by hydro power-plants, leaving little water in the path of the river. The trout fries seeding in order to restock the torrent after the end of the fishing season; the high quote poaching and the moving of sheep flock from high pastures. The hydroelectric power station in the village and the kids “stealing” water for their summer pool. This constant ambivalence is furthermore underlined on the acoustic level that invades the framed reality with off-screen sounds. In some cases image and sound are in open contrast. A wide range of noises from motorbikes, trucks, industrial sites raises from the valley bottom towards meadows and woods apparently wild and remote. Ignition focuses on the limen between the last blocks of houses in the north part of Cork City and the gorgeous Irish countryside. Knocknahaeeny, a problematic workers neighbourhood, seems to be a village with its own rules. 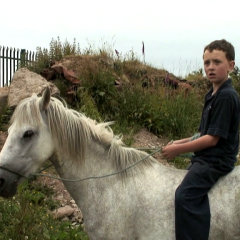 The travellers, the so-called Irish gypsies, have also their settlements there. Frictions raise among local population. We found a wasteland scattered of garbage piles, meadows surrounded by rows of carcasses of squeezed cars, horses wild breeded and a u.f.o.-like water tower, glimmering green light at night. That is the natural playground of the kids from the area. These extremely lively kids play hours far away from parent’s eyes, jumping walls, crossing fences and riding horses. Their vivacious presence re-enact the environment transforming it in a sort of western scenery. In this dodgy periphery Bonna-nite (bonfire night), a Celtic ritual celebrating the summer solstice, becomes the occasion to burn all sort of rubbish accumulated during a year. In a sort of challenge among gangs, the kids prepare the heaps weeks in advance, gathering the materials everywhere: at sunset they put them on fire. They especially love car tyres, for their flammable properties.